Traffic in Santa Cruz, California this summer is at an all time high. Come to think of it, all down the coast of California it’s been horrendous. It took a combined total of over 30 hours heading down and coming back from our San Diego vacation last month. We’d cruise along at first, then grind to a stop. Bumper cars occurred in San Luis Obispo, Santa Barbara, Valencia (by Six Flags Magic Mountain), Los Angeles, San Diego and back again. Unless you live in remote areas, you’ve probably experienced the same. Writing this week has been like the traffic in California. The ramp looks clear, I press the gas and charge ahead to “enter the motorway” (said with the British accent of a woman on my husband’s GPS) only to apply the brake as I see the 15 mph crowd of cars. Then, within a few miles, the pace increases, a great fast-lane speed is attained, and I feel certain I will make my destination on time…for a few miles. Seeing red lights in the distance causes my heart to slump. After a half hour of rush and slow, I take my foot off the gas again with a frustrated WHAT NOW? I think about my son’s question. How simple the solution seems. Why do (does) the cars (the writer) keep stopping? Why doesn’t she just keep writing???? The entrance to my writing freeway looked clear at the start of the week. I accomplished a lot in the first couple of days. Brendan’s writing surplus has made up for my lack, and I could barely edit, insert his work and edit some more before he sent me the next email attachment. Encouraged by the progress, I typed away and caught up to him, shut down on time for a change and got in my eight hours of sleep. The next day I headed to the library to work away from home in an attempt to focus and finish my editing. But, between the time I arrived in the library parking lot and actually started work inside, life’s traffic standstill took two hours. I fielded unexpected phone calls, text message questions, and my computer battery inexplicably went into crisis mode and quit. So much for the idea of getting away from home to be more productive writing! Most of the time when traffic piles up, I look for a side street alternative. Did I mention that currently, where I live, not only the freeway, but all those alternate routes are under construction? Doesn’t leave much option besides sitting in the traffic jam or staying home. One way gets me somewhere, the other simply postpones the trip. Today, when the biggest jam of all took place (five hours of trying to find and book a hotel for an impromptu getaway next week to plan our schedule–the irony is not lost on me! ), I thought about the correlation of writing, distractions and the stop and go of a congested highway. If I want to get to my destination, I MUST keep driving. Or writing. Sometimes the going will move along at a fantastic pace, and I’ll revel in the progress. Other times, I’ll creep along and watch minutes tick by in hours as if I’m a lady bug crossing the length of a football field. The truth is that both are moving forward. It’s my mind and heart that get into a jam and want to postpone the trip. What brings you to a standstill? How do you keep yourself moving forward? Are you in a jam? Great analogy. 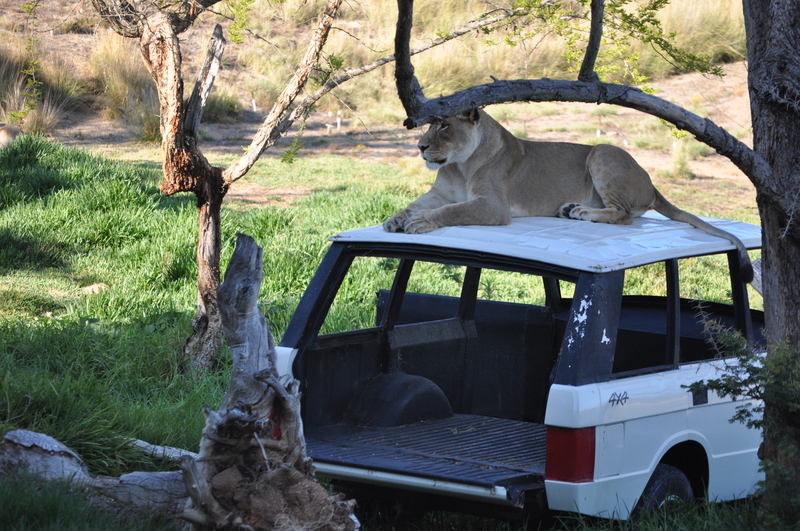 Love the photo of the lion on the car.